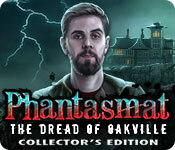 Phantasmat: The Dread of Oakville Collector's Edition is rated 4.2 out of 5 by 62. Rated 5 out of 5 by tutortime from Excellent Series ! These games just keep getting better and better. 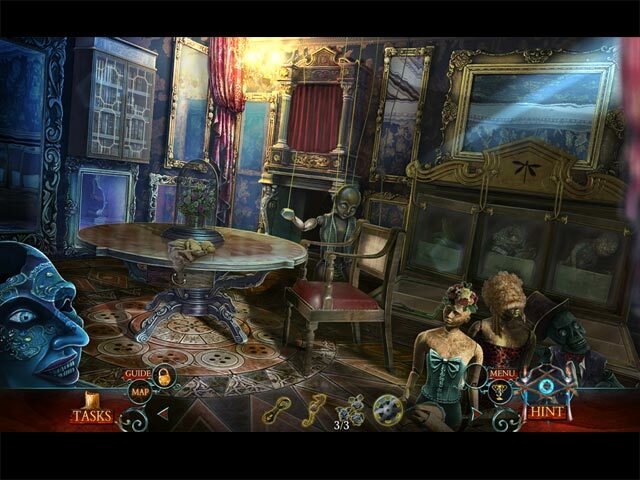 Great storyline, graphics ( a bit dark ), interesting mini games and very long game play. Extra feature - morphing objects. The CC edition was worth the money as it had a ton of new scenes to interact in. Extra feature - at end of game, you go back and find objects in 28 scenes. Others games do this and I am not sure I like it. I would rather find them as I play the game. Rated 5 out of 5 by kerith90angel from Based on Full game & bonus: Here is whats in the CE after demo TO BIG FISH:: Please pass this along to DEV Eipix ,if possible, with hugs of course!! ****may contain spoilers*** This was my favorite game to date by Eipix. I Loved the dark story and this had one of the BEST SE ENDS I have seen in a while. You had me hop out of my chair, with those spookies jumping at me in the dark! The SE took me 5 hr 20 min to finish. The Bonus play took me 1 hr. 36 min -and this included 6 min, looking for the ce content for the Souv. Room. WTG- It has an in game 47 page Strategy guide. There are 7 chapters with the bonus play. Chap 1 is 5 pgs., Chap 2 is 4 pgs., Chap 3 is 5 pgs, Chap 4 is 6 pgs, Chap 5 is 6 pgs, Chap 6 is 7 pgs. and the Bonus or chap 7 is 8 pgs./ directions take 1 pg and Collect. content is 5 pgs long. There is NO DIARY that holds story. I play a lot of games at the same time so it always helps if I have a storyline refresher. END OF SE PLAY: I loved the end of this game. We see something SUPER SPOOKY,,, in the dark,,,, and it reminds me of how the game Maze 1 had that creepy doll, in the hall, that makes makes you cover your eyes...LOVED THE END of OAKVILLE. BONUS GAME PLAY: This took me 1 hr 30 min to complete. The bonus play is EXCELLENT in this game and I thought it was better even than the main play. I have to admit though.....we meet a character in a blue polka dot dress that I BELIEVE was a main character in SE play but she turns spooky and does a wardrobe change into that blue polka dress behind a bush I guess, because suddenly she has on different cloths, and she looks like she came up from the lake floor. If it WAS a new character then the story then it confused me. MUSIC- There are 10 saveable tracks which I didn't save. The original Phantasmat is known for its GORGEOUS music during the hidden obj. play. You know music is good when you hunt down the creator on google.... which you can for Phantasmat #1. So DEV if you want a hit like Phantasmat #1 you need outstanding music! And Morphs. REPLAY- match 3, 17 hos, 21 minigames, & 16 cutscenes -- none of which I replayed. I have too many other games I purchased I want to play next. WALLPAPERS- 8 x 4 sizes. INSTEAD OF CONCEPT ART- there are 9 GREEN SCREEN pictures of some of these cool DEV that are before and after pics during the games creation. Wish there had been more and wish all games would dump Concept art for these instead. BEHIND THE SCENES- I put my cell phone on stopwatch- it was 58 seconds long. It was set up kindof like the silent films of the 1920's. You watch some of the Eipix stars from this game imported into little scenes of the Phantasmat Oakville world. It was fun but done better in MCF Shadow Lake as a type of "lets show you what happened behind the scenes, interview type." GRAPHICS: I need to take a side note here for the graphics. Yikes, these graphics REALLY need work. A few rooms, too , the perspective was off, such as the Chapter 4 BALLROOM, being one. I am unclear why this DEV always chooses to go with hand drawn cartoon like graphics that have a filter?? I guess it's a filter. 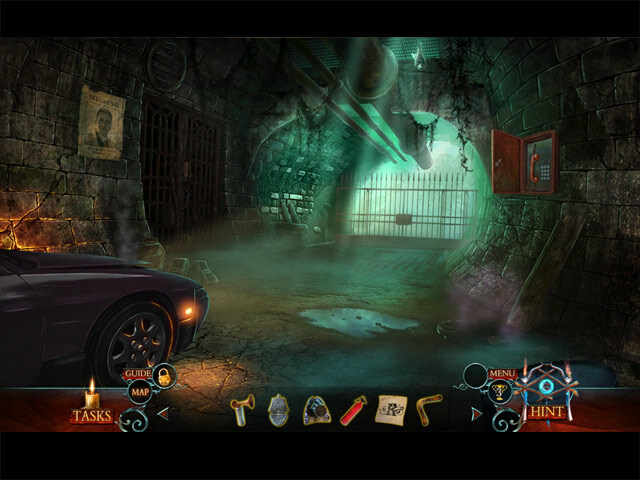 It makes the whole game somewhat unclear and I KNOW from games like MCF Escape from Ravenhearst and the Midnight Mysteries series that you don't need to unclarify the graphics like this. They may work on a Ipad or a smaller 15" computer... But many of us die hard buyers of Big Fish own large monitors JUST FOR THESE GAMES. So if it's in your arsenal to use live characters-- like we see in your CE PICS CONTENT... use them!! It would totally fix the prob with lip movement that I see a lot of the reviewers complain about. ACHEIVEMENTS/COLLECTABLES/ & SOUV. ROOM/ Each has its own page; and wowed by none of them. I DID like the Morphs per scene- I missed 3 after the game and they make it possible to GO BACK and collect those. Kudos to that. But none of these things will unlock additional content. I found the Souv coll to be a moot point. It takes 6 min. AFTER you complete the game you go into CE content and re-visit 28 scenes and collect an item that unlocks nothing. There are no screensavers. TO EIPIX--- why don't you have SCREEN SAVERS in any of your games?? I am sure that would push me to get the CE version if you offered one or more...like some other DEV. As I often state... it is a great way to FLASH IN FRONT OF your customer to buy the next segment of your game. Because if you can physically see a screensaver in front of you/ that has saved to your computer- and doesn't go away with the removal of the game/ It means that big fish fan liked your game enough LAST TIME to buy the CE version; and more than likely will buy the next installment!! I have noticed you have a few games and you make new installments from 6 months to a year. So this theory would REALLY HELP YOU SELL THE CE'S. It would be cool too, to hear the cool people/ instead of just seeing them// in BEHIND THE SCENES- and what that Eipix artist created, or intro the voice actors, some of which we know now and would love to meet!! I've stated many times you are all like movie stars to us and we WANT TO MEET YOU!! Hugs and xox for a terrific world you created and I hope you take my well meant criticism. I had a blast with this game and highly recommend it. Rated 5 out of 5 by Torpedo1 from Dreadfully Good Nice little scares in this one and a little creepy at times. Cut scenes were excellent along with characters and dialog. Love the HO's in this one. Has a jump map, morphing objects, journal, and great game play. Have to buy this one soon. Rated 5 out of 5 by Griselda2012 from EXCELLENT GAME! I finished the demo of 90 minutes. This game is excellent. Nothing bad to say about it. It's full of suspens. The graphics are very beautiful. The characters too. The sound emphasizes the whole story. I bought two others "Phantasmat" and shall buy this one too! Rated 5 out of 5 by Coolbythepool from Great Game One of the best games I have played recently! Rated 5 out of 5 by lisha2100 from Great addition to the Phantasmat collection! The second I saw this I had to have it. I love the Phantasmat series, and the story lines. I have been playing Big Fish games for years and this series is one of my all time favorites, I definitely recommend for you to give this one a try. It truly has this feeling of dread from start to finish, and is up there on the creep factor. I am not going into detail on the storyline becomes many others have done a perfect job on describing it without giving too much away. In all the Phantasmat games you have to find out whats going on with all these people? Why do they act so strange and why are their eyes pitch black? I also found the puzzles to be pretty good and not too hard, Also I loved all of the HOS, the graphics are beautiful as well. Cannot wait for the next one! Rated 5 out of 5 by missmaryblonde from Tremendously fun! Excellent graphics, and the bonus game is a good length too. You get your money's worth with this one!